Rajendra Sharma is a Senior Hydrologist at the Government of Nepal’s Department of Hydrology and Meteorology. He monitors real-time data on rainfall and river water levels to assess the risk of floods and landslides. Until 2009 the water levels of Nepal’s rivers were gauged with the help of a measuring scale installed near the river edge. To monitor water levels this system required members of local disaster management committees to regularly visit the measuring scales. This manual process was not only time consuming but prevented the quick assessment essential for identifying the risk of flooding and landslides. As a member of Nepal’s water-related Disaster Management Committee, Rajendra is responsible for monitoring disaster risk in all eight flood-prone river basins across Nepal. For this he needs real-time, reliable data on river water levels and rainfall. He needs this data to identify the risk of flooding and landslides so that he can send timely warnings to the communities at risk of being affected and to the rescue authorities to warn them of the need for immediate action. To address this need, the Department of Hydrology and Meteorology has installed a web-based telemetric system that provides real-time data collected through automatic sensors at hydrological stations built in river basins. Using real-time data on water levels to enable flood early warning: The data from the web-based telemetric system overseen by Rajendra and his team has, in some government offices, been fed into an electronic display board. In 2012 when the water level in the Rapti River reached the warning threshold, the system transmitted data directly to the electronic board in the Rapti district government office and triggered an automatic siren. This notified district officers and members of the Disaster Management Committee to raise a public siren and inform the local community of the flood risk. Using inundation maps, Rajendra and his team were able to identify specific locations that were at risk and send alerts using mass SMS messages to the downstream communities before the flood reached them. Early flood alerts helped people to move out of the danger zones, along with their movable properties and valuables, to safer places. Using web-based data to increase disaster response lead time: In June 2013 three days of heavy rainfall caused the Karnali river’s water level to rise rapidly. By using real-time data from the web-based telemetric system, Rajendra and his team were able to monitor Karnali’s water level and predict the extent of the rise. When the water level reached 9 metres Rajendra and his team were able to immediately notify the Bardiya district officials to sound the siren warning people to stay alert. And then as it rose to 10 metres they were able to inform the local community to prepare for evacuation. 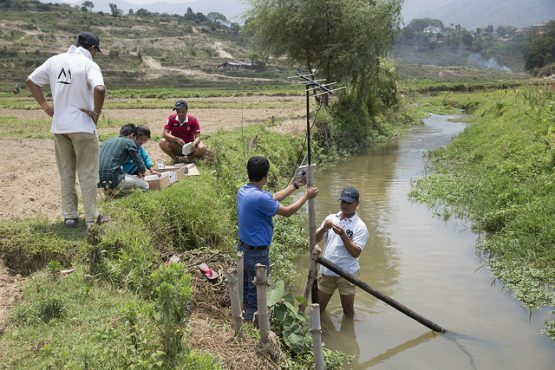 The real-time data allowed Rajendra and his team to predict that the water level would reach 11 metres, which provided the Nepal army and police force sufficient time to move the local community to a safer location. Using real-time hydrological data to enable effective coordination: The web-based telemetric system links data automatically to a warning system in the Ministry of Home Affairs’ National Emergency Operation Center. When the data indicates a rise in water level above a certain threshold the warning sirens turn on, enabling the Center to take quick action. Based on this information the Center is able to make decisions on how many rescue teams should be mobilised and where they should be targeted, allowing effective coordination between the Centre and the affected districts. Theft of the water censors installed besides river courses is the major problem for Rajendra and his team in collecting timely data. As well as being stolen, the censors are sometimes washed away by flood water. These have to be regularly replaced for Rajendra to be able to access location-specific timely data on water levels. Another challenge for Rajendra in accessing real-time data is the poor internet connectivity and weak communication network in the locations he works. This causes delays in the transfer of data from the hydrological stations to the web-based telemetric system. The delays in the receipt of the data risk the ability of the Disaster Management Committees to take quick and informed decisions in urgent circumstances.